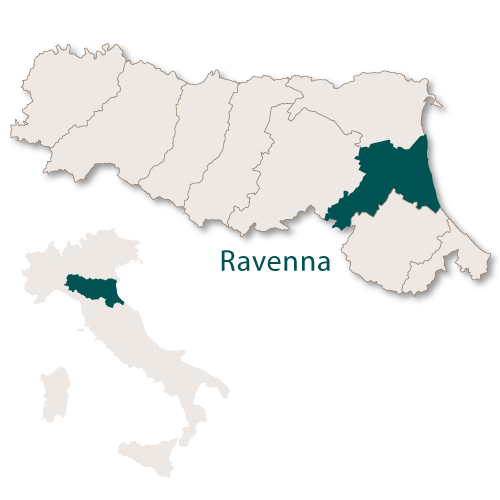 The province of Ravenna has an area of 1,858 sq.km. and borders the province of Ferrara to the north, Bologna to the west, the region of Tuscany to the south west, the province of Forli Cesena to the south and the Adriatic sea to the east. 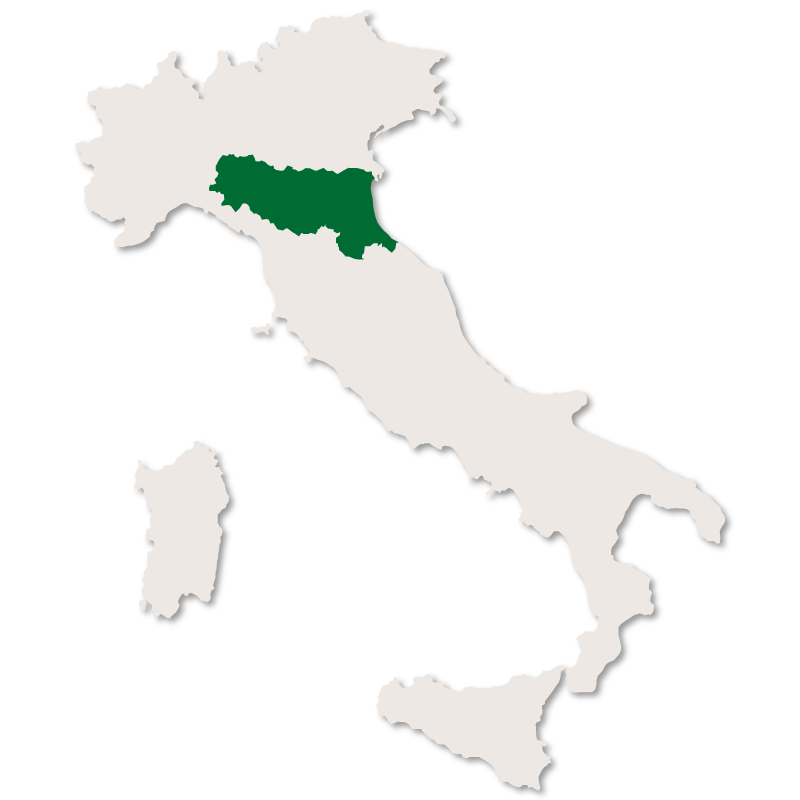 As with some of the other provinces of Emilia Romagna, the landscape of Ravenna varies from mountains, across hills to valleys and flat plains to the marshes of the Po Delta. Although Ravenna is slightly inland it is connected to the Adriatic sea by the Candiano Canal. The Regional Park of the Po Delta spans this province bringing with it the diversity of exotic flora and fauna for which it is famous. The coastline stretching along this province is some of the most famous in Italy attracting the upper classes from Venice and other wealthy northern regions of the country. The beaches are flat, straight and sandy with many of them backed by stunning pine forests. Ravenna has always been a prosperous city and was once the capital of the Western Roman Empire. It later became the centre of the Byzantine empire before it was conquered by the Lombard King Aistulf. In spite of many battles over the years and a strong involvment in World War II, Ravenna has somehow managed to escape serious damage and is now considered to be one of the most beautiful and interesting cities in the region of Emilia Romagna. Baptistry of Neon which dates back to the year 430 making it the oldest building in the city. It is an brick structure in an octagonal shape which symbolise the seven days of the week plus the Day of the Resurrection and Eternal Life. It has a mosaic ceiling but the original floor is now about three metres underground. It is classed as being the 'finest and most complete surviving example of an early Christian Baptistry'. The Mausoleum of Galla Placidia also dates back to around 430 and has been described by UNESCO experts as being ' the earliest and best preserved of all mosaic monuments, and at the same time one of the most artistically perfect'. Most of the walls and the ceiling of the interior are covered with Byzantine mosaics, some of them depicting different scenes. The lunette over the northern entrance shows Christ as the Good Shepherd whereas the one on the southerly wall shows St. Lawrence standing next to a flaming gridrion. The Mausoleum also contains three sarcphagi (coffins made from a particular type of limestone which decomposes the flesh of the body within). One of them is believed to contain the remains of Galla Placida, daughter of the Roman Emperor Theodosius I. The other two supposedly belong to her husband and either her son or brother. The Arian Baptistry was erected by the Ostrogothic King Theordoric the Great at the end of the 5th century. It is octagonal with small apses and arched openings at the top and is believed to have once been part of a larger building. Inside it has four niches and a dome, all of which are covered in mosaics depicting the babtism of Jesus by St. John the Baptist. The design is simple and quite obviously took several years to complete but it is worth noting the exorbitant amount of gold used in the background to create a celestial glow. The Archiepiscopal Chapel which is a chapel on the first floor of the Bishops's Palace and was constructed around the same time as the Arian Baptistry. The Basilica of Sant'Apollinare Nuovo is a church, again erected by the Ostrogothic King Theordoric the Great at the beginning of the 6th century. It has been modernised at various times and some of the internal mosaics have been destroyed. On the left wall there are 13 small mosaics which depict the miracles and parables of Christ and there are 13 on the right wall which depict the Passion and Resurrection. There are also 16 mosaics on each side of haloed saints, prophets and evangelists. The Mausoleum of Theoderic was built in 520 by King Theordoric the Great as his future tomb. It is made from Istrian stone and is divided into two portions, one above the other. The roof is one, single Istrian stone which is 10 metres in diameter. The Basilica of San Vitale is based on an ocatagonal plan and work began in 526 before the church was finally completed in 547. Again, the interior is decorated with many intricate mosaics depicting various religious scenes, this church showing many scenes from the Old Testament including Moses and Cain and Abel. The Basilica of Sant'Apollinare in Classe is a striking brick structure which was built at the beginning of the 6th century. The nave has 24 columns made from Greek marble and the interior decortation is rich and intricate. Also inside there are numerous sarcophagi from different centuries. Rocca Brancaleone, a castle built by the Venetians in 1457 it was once part of the city walls but is now a public park. The Communal Gallery which has some interesting pieces of art on display. 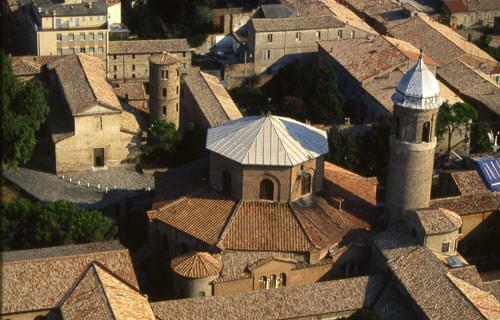 There are two museums, the National Museum and the Archiepiscopal Museum. The 6th century church of St. John the Evangelist. St. Francis basilica where Dante Alighieri is buried in a tomb annexed to the church. The basilica of Santa Maria Maggiore which is a Baroque church built in the 6th century. San Giovanni Battista, a church built in 1683, also in the Baroque style with a bell tower from the middle ages. The basilica of Santa Maria in Porto, a 16th century church. 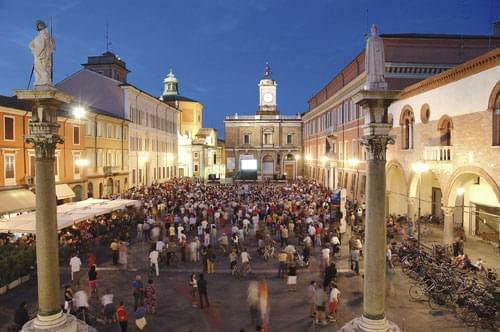 Every year the city hosts a classical music commemoration, The Ravenna Festival. Opera performances are held in the Teatro Alighieri and outside concerts take place at the Palazzo Mauro de André. Musicians and conductors from around the world are attracted to this festival and it is always well attended. The town of Faenza is set in an extremely fertile area with a large agricultural industry and is surrounded by gentle hills covered in vineyards. The main centres of the town are the Piazza del Popolo with its porticos and the Piazza della Libertà. Faenza is noted for its manufacture of majolica glazed earthenware pottery, known as 'faience' which is taken from the name of the town. This pottery from Faenza is recognised for being highly artistic and creative and is widely considered to be some of the best in the world. The town has a Museum of Ceramics in which there are fine pieces on display from all around the world. The Palazzo del Podestà is in the Piazzo del Popolo and is of medieval origins but was largely restored in the early 20th century. The Town Hall is also situated in the Piazza del Popolo, is also of medieval origin but was entirely altered during the 18th century. 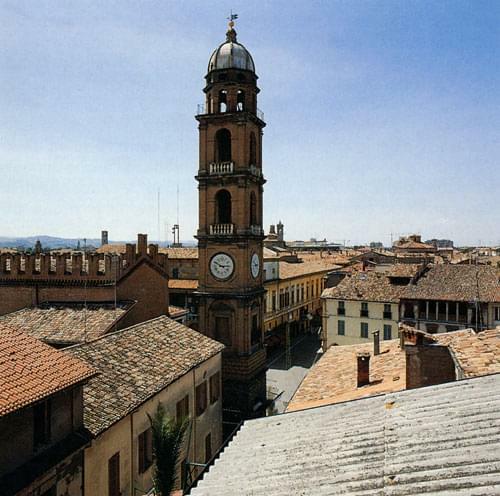 Faenza Cathedral can be found in Piazza della Libertà and is very influenced by the Tuscan style. Built in the late 15th century the marble decoration on the façade is still unfinished. Inside it has several works of Renaissance art and sculpture. Goldsmith's Portico, which is directly opposite the Cathedral,is an open gallery with a fountain with bronzes and was built at the beginning of the 17th century. The Clock Tower is at the entrance to the Piazza della Libertà. Away from these two piazzas you can find the Neoclassical Palazzo Milzetti, the Teatro Masini and the Villa Case Grandi dei Ferniani which has a collection of Faenza ceramics. The Castle, from which this village takes its name, was built in the late 14th century. In 1501 both the castle and the village walls were destroyed by Cesare Borgia. The walls were rebuilt in 1504 but today only parts of the wall and castle remain. Other than the castle this tranquil little village has the Church of San Sebastiano which was built in 1506, the 18th century Church of San Francesco and a Civic Museum. Chiesa di Santa Maria Assunta which is actally the cathedral and was built at the end of the 17th century. Il Museo del Sale (Museum of Salt). This is a true medieval village in the valley of the river Lamone, halfway between Ravenna and Florence. 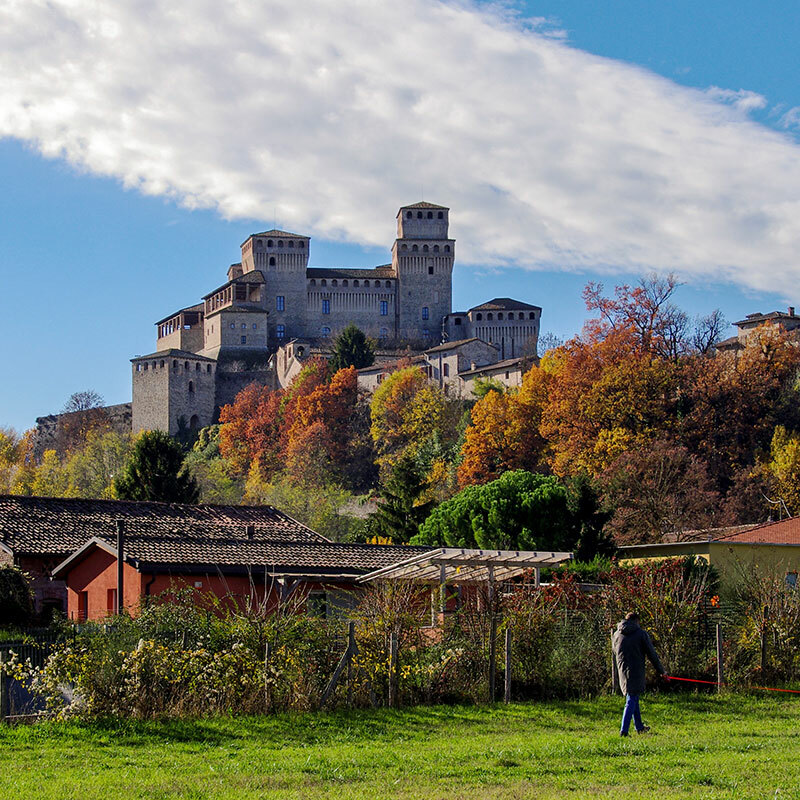 The village has three hills, one with a castle, one with the Sanctuary of Monticino and the last with the Torre dell'Orologio. 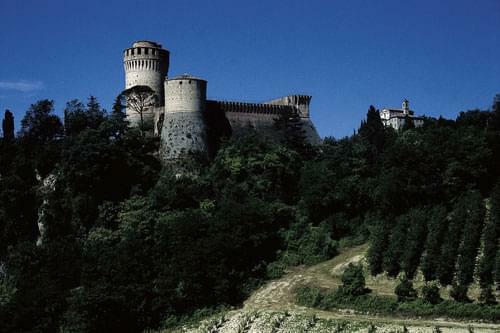 The castle, Rocca, was built in 1310 by the Manfredi family and has several cylindrical towers. The Sanctuary of Monticino dates back to the 18th century and has frescoes inside painted by Savino Lego. Behind the sanctuary there is a cave where chalk was once mined and this is now an open air geological museum. Torre dell'Orologio (clock tower) was built from square blocks of chalky rock and was once part of the defensive structure of Brisghella. It has been damaged and rebuilt many times over the years and when it was totally rebuilt in 1850 the clock was added to the tower. The village was formed in 1216 after the destruction of the Casola castle by soldiers from Faenza. It was subsequently seized by many prominent families, including the Borgias. The most prominent landmark of the area is Monte Baggaglia which is a mountain with a medieval tower on its summit. Abbazia di San Giovanni Battista in Valsenio (Abbey of Valsenio). The small town of Lugo is home to the rocca Estense (Este Castle) with its beautiful 19th century garden. It also has the Pavaglione which was a 19th century covered market specialising in the silkwork trade. It also has the Pavaglione which was a 19th century covered market specialising in the silkwork trade. The Teatro Rossini is a 445 seat opera house. There are also two churches of note, the Collegiata church and San Francesco di Paola which was built in 1890 and has a terracotta sculpture of the dead Christ. The well known Italian singer Laura Pausini was born and grew up in Solarolo. 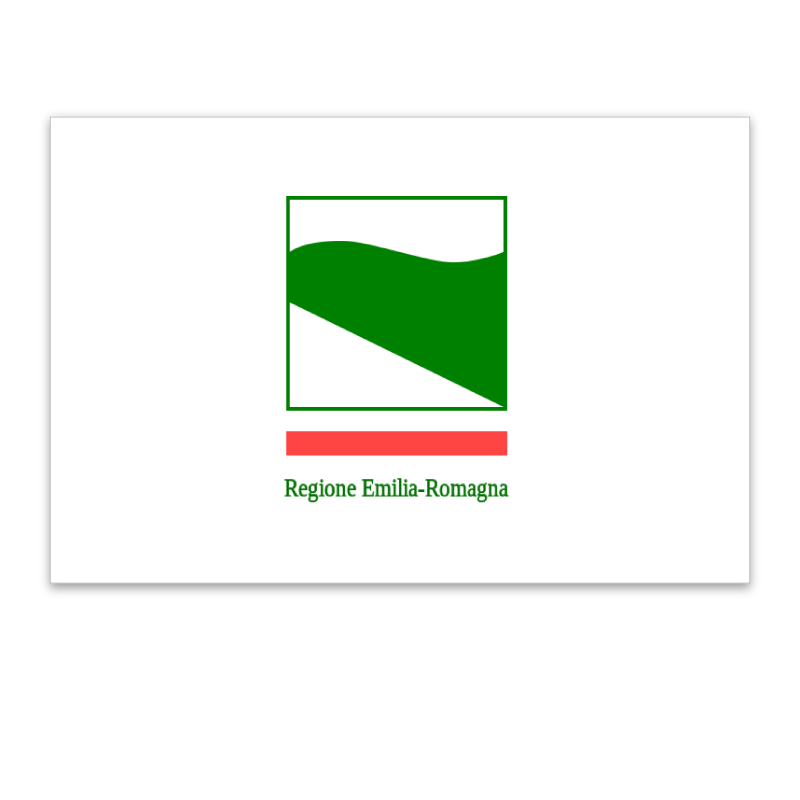 Emilia-Romagna, at your own pace. 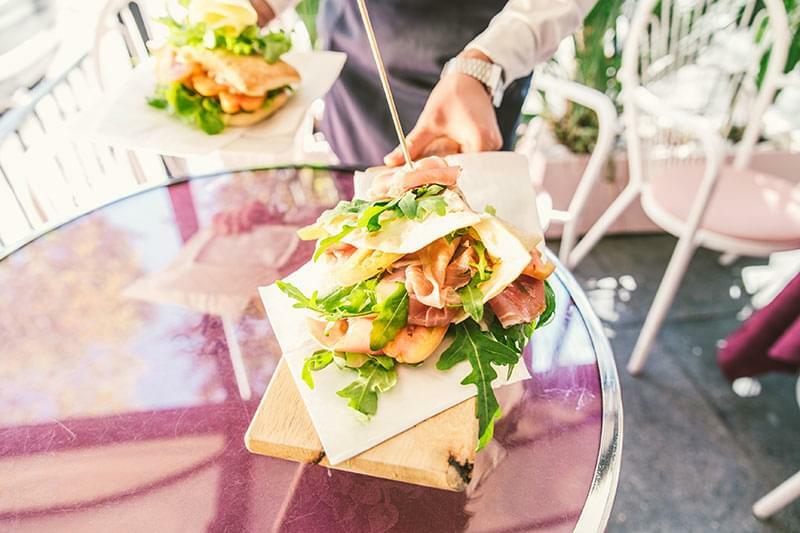 Explore Emilia-Romagna, Italy’s gastronomic heart and soul on a cultural journey by car.